Got kids? Kauai's beaches and activities are awesome for families! Aloha! And welcome to our site!! Kauai is our favorite Hawaiian island to visit with kids because it's beautiful, not so touristy, and there's tons of things to see and do. Oh yeah, and it's pretty cheap compared to Oahu and Maui! I've been coming to Hawaii my entire life. My parents brought me here for my first vacation when I was 2 years old, and I've never stopped coming back...We even got married in Hawaii! The prerequisite romantic Kauai sunset! ...of course, you can't help but still get that romantic feeling sometimes, because hey, you ARE in Hawaii!! ...so we soon had so many people with families asking us where to go and what to see, that we decided to just save ourselves the trouble, and put all the info here!! We're so SAD it CLOSED last year! ...I sure wish WE knew what we've learned before we first came, it would have helped us make much better use of our vacation time, and more importantly (especially these days), our vacation dollars! First off, I should tell you that we LOVE to eat! And we love going to the beach too! So we’ll tell you what beaches are the best for kids, and some REALLY cool places to sight-see and explore. You can also get the lowdown on the incredible variety of activities available on the "Garden Isle". So get in the Hawaiian frame of mind... Relax, take your time, explore our site, and then bring your keiki to Kauai! 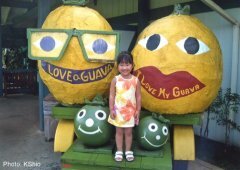 Vacation in Hawaii with your kids - Kauai, our favorite island for families! 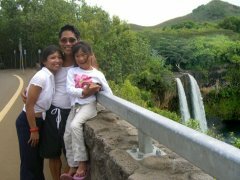 Kauai - an awesome vacation in Hawaii with your family where there's lots of thing to do to keep the kids entertained! Kauai, some things you should know! The best Kauai beaches for kids! Lots of info on our favorite Kauai beaches for swimming with the kids! The safety and surroundings make these beaches our top choices for families with kids! Find the best beaches in Kauai - lots of info on Kauai Beaches from Princeville to Poipu, and all in between! Kauai weather changes constantly - and you can chase the sun if you don't like the rain! Kauai restaurants that are easy to take the kids to....check out our list of favorites! Find cheap Kauai restaurants that won't break the budget! Find cheap Kauai restaurants that serve good food for a decent price! Which Kauai vacation rentals does your family require? Kauai vacation rentals range from upscale resort hotels, to condos and bed and breakfasts! Find lots of info on places to stay with your family!! The history of Hawaii and Kauai is a fascinating blend of legend and fact! The history of Hawaii is steeped in legend. From the Menehune's overnight building feats, to Cap. James Cook being killed over a rowboat, stories abound! Contact us and say aloha! Say aloha, or send us questions, comments or suggestions!